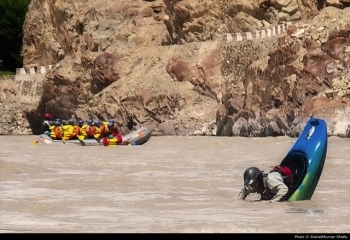 A range of rafting options are available on the Indus and its major tributaries.The best stretch for professionally guided runs on the Indus whitewater between Spituk and Saspol.Beyond Saspol the river becomes difficult and surmounting it requires technically skilled participants and careful organisation.The most difficult but exciting option for river rafting is on the Zanskar river along its spectacular course through the gorge in zanskar mountain ranges.Adequate arrangement for rescue coverage is an essential prerequisite for embracing up a white-water expeditions . One can feel the adneraline gushing out as the rafting bounce against the rocks in the water. Join Lynx Expeditions on the white-water rafting trip and discover the relaxation of drifting down the river without a care in the world.The exhilirating of rafting in the most exciting river offer the seldom seen natural wonders. The best season for a river rafting is from June to October.All the basic instructions and precautions are taken care of before departing in the river.Our trained staff takes great pride in its ability to provide our guest with an action-packed ,fun-filled adventure.